Walk into any hotel, house, office building, museum, art gallery, or any place where there are paintings or photographs hanging on the wall, and chances are that you will see a pastoral landscape. Looking for protection, food, and water — According to Denis Dutton, a philosopher and the author of The Art Instinct: Beauty, Pleasure, and Human Evolution, this is because of evolution and the Pleistocene era. (see Dutton’s TED talk: http://bit.ly/cIj9uo). 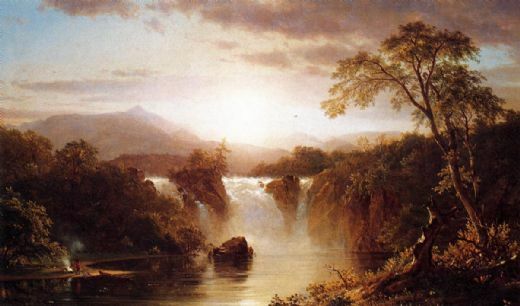 Dutton says that this typical landscape scene includes hills, water, trees (that are good for hiding in if a predator comes by), birds and animals, and a path moving through the scene. This is an ideal landscape for humans (protection, water, food). Beauty helps us survive — Dutton’s theory about beauty is that we have evolved to feel a need for certain types of beauty in our life, and that this pull towards things such as these landscapes has helped us to survive as a species. He notes that all cultures value artwork that has these scenes, even people who have never lived in a geographical location that looks like this. Pastoral scenes promote healing — Roger Ulrich (1984) found that patients whose hospital window overlooked scenes of nature had shorter stays in the hospital, and needed less pain medication compared to patients whose rooms looked onto a brick wall. What do you think? Are we “programmed” to like scenes that represent our best survival? Is our definition of beauty based on places to live where we have the best chance of survival? You’re probably also aware of the research showing that people (across many cultures) find a particular fixed percentage of trees to grassland (thinks rolling hills with some occasional clusters of trees) the most aesthetically pleasing — and this is why the teletubbies live in the land they do. As a painter of pastoral scenes, I find this post very interesting. I have always preferred painting natural landscapes, I thought because I love the outdoors and the colors of light, and natural forms and textures are just more appealing to me than cityscapes. I experience a deep peace studying and painting these places which I try to convey in my work. Perhaps this “peace” is a primal one. Certainly I will be looking at landscape in a new way after reading your post. I recently completed a large pastoral painting for a hospital. They are using Art as Therapy in their facilities as studies have proven the beneficial effects of art. Thanks for sharing this Susan. There is truth to the theory but it also has limitations. We live on a ridge and I’ve thought about how satisfying it is to be able to look out over a distance. Our ancestors probably liked to be able to see whether enemies were coming and whether huntable animals were nearby. On the other hand, I see beauty in a coming storm and even in lightning strikes. And these are not things that safe or comfortable!